The Atlantic Tarpon is a saltwater game fish which is found in coastal waters of the Atlantic Ocean in addition to estuaries, lagoons and rivers which favours sub-tropical and tropical waters. The Atlantic Tarpon is tolerant of wide ranges of salinity throughout its life span making it possible to survive in the tropical waters of Thailand’s fishing lakes and ponds. Atlantic Tarpon are one of the worlds most sought after saltwater gamefish by international fly fishing enthusiasts and have been recorded at weights in the excess of 160kg’s and 2.5 meters in length. The Atlantic Tarpon is an easily identifiable fish with a large mouth with upturned lower jaw and sleek streamlined body covered in shimmering silver scaling with the dorsal region of the Atlantic Tarpon displaying a blue to green colouration. Atlantic Tarpon are renowned for their hard fighting qualities and high octane aerobatic displays when hooked. 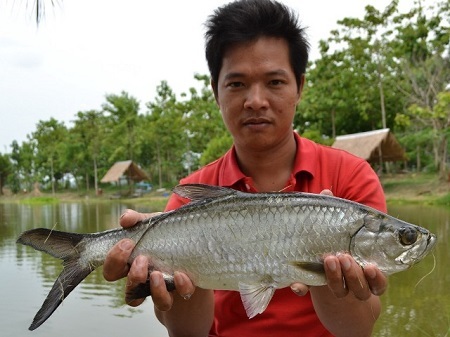 Atlantic Tarpon have only recently began to appear in the fishing lakes and ponds of Thailand stocked at very low weights to approximately 2 kg’s. We wait with baited breath to see if the Atlantic Tarpon will join the ranks of the many other monster fish species which are already present in Thailand’s many commercial fishing lakes and ponds. Palm Tree Lagoon received a stocking of Atlantic Tarpon in the summer months of 2013 with fish to 2kg’s in weight.